Background: Five years of sustained collaboration between a Thai and an Australian university known as the Thai–Australian Alliance, has included participation in a doctoral program in Australia, participation in research projects in Thailand, study tours and student exchanges between the partner organisations. The purpose of this partnership is to focus on capacity building in rural health service management to foster cross-cultural collaboration and knowledge transfer in this field. Aim of Study: This project aims to extend the impact of the Alliance through a knowledge translation approach based on aligning researchers and research users in collaborative activities that are situated in real health work contexts. Methodology: The project has an interpretative phenomological approach including an evaluation of the benefits of an international study tour, the development of health management curricular for primary health care professionals in rural Thailand through collaborative action research and, currently the implementation of an innovative knowledge translation project involving academics of both universities and doctoral students from Naresuan University. Findings: The study has demonstrated the importance of prior preparation and knowledge acquisition before the event and the need to ensure a locus of control and organisational support to participants post tour to successfully implement health reform. 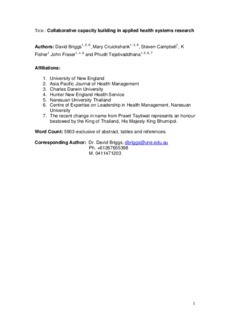 The development of health management curricula utilising health professionals, policy makers and community groups has seen the development of a new public health masters program in Thailand. Conclusions and implications: The project will test a further approach in expanding access to scholarly support to academics and doctoral students in developing countries that would not normally be possible through traditional approaches. The project will also test the efficacy of one approach to knowledge translation proposed by Lavis et al (2006,HPSR/WHO 2008) in aligning researchers and research users to improve knowledge translation. It is also proposed that the study will further indicate the importance of experiential, contextual work based learning for health service managers. This approach is also being extended to a similar approach with Indonesian universities.